SIX-STRING STORIESis Clapton’s third sold-out book with Genesis, following 24 NIGHTS and LIVE IN JAPAN. Eric has also contributed to CONCERT FOR GEORGE: a celebration of the life of his friend George Harrison. A very small number of these remain available to order here. 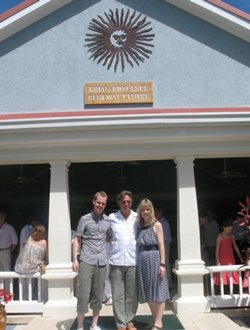 Left: Eric Clapton with Nick and Catherine Roylance at the opening of the Brian Roylance Renewal Centre, Antigua.